Deputy Defense Minister Yuri Borisov has revealed that the Russian military has commissioned several types of laser weaponry, but remains tight-lipped about the kinds of systems being developed. What kinds of systems does the officer have in mind? Military experts speaking to one of Russia's leading independent newspapers attempted to find out. On Tuesday, speaking at an event commemorating the 70th anniversary of the All-Russian Research Institute for Experimental Physics in Sarov, central Russia, Borisov said that laser weapons are no longer a novelty for the Russian armed forces, with the military already in the process of commissioning and even adopting several types of laser-based weapons systems. Earlier, Borisov indicated that high-tech weapons systems, including lasers, would help shape the capabilities of the Russian army in accordance with the state arms procurement program up to the year 2025. In late 2014, amid reports of the US Navy's testing and deployment of its Laser Weapon System (LaWS) in the Persian Gulf, Yuri Baluyevsky, former Chief of General Staff of the Russian Armed Forces, teased observers worldwide by indicating that Russia has been working to keep pace with the US in the development of laser weapons technology. In late 2014, Bloomberg reported that US Navy ships in the Persian Gulf had been deployed with laser weaponry onboard capable of destroying small targets, including small drones and RPG weapons, and the engines of inflatable dinghies. 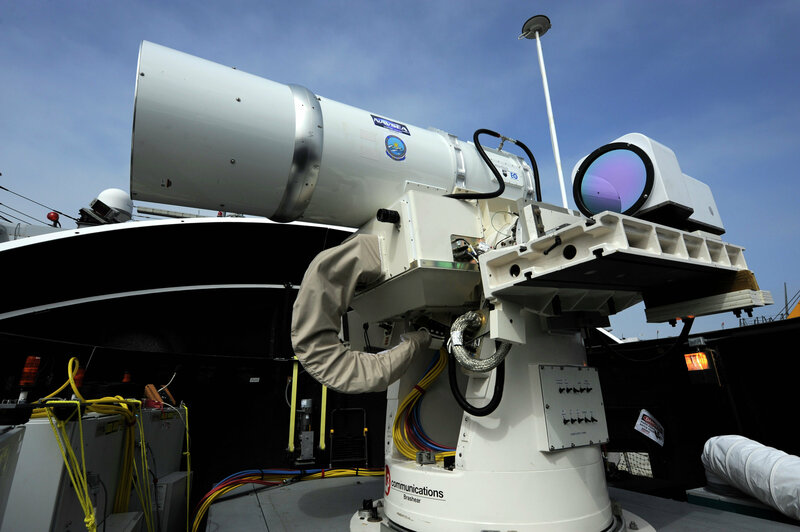 The LaWS system is believed to generate about 30 kilowatts of energy for its laser beam, with the Navy spending about $40 million on R&D and testing of the system. Commenting on the significance Deputy Defense Minister Borisov's remarks in an analysis for the independent online newspaper Svobodnaya Pressa, columnist Anton Mardasov recalled that the LaWS-type system has even been suggested by some experts as being the only realistic weaponized laser system given present technology. At the same time, the journalist recalled, "the US had long been engaged in the creation of a combat laser system, based on a modified Boeing 747-400F cargo plane. In February 2010, according to the DoD's Missile Defense Agency, this system successfully managed to hit two ballistic missiles – in the boost phase of the flight; however, subsequent tests failed, and in 2011 the Department of Defense found the system unworkable and too expensive." Explaining the program's termination, Mardasov recalled that the testing was conducted at a specially-prepared range, against a known target, "and most importantly, under ideal weather conditions, since even the slightest change in the atmosphere or the presence of water vapor results in a drop in the effectiveness of such weapons by literally orders of magnitude. As a result, the Boeing carrier of the combat laser was sent into storage at the 309th Aerospace Maintenance and Regeneration Group," better known as the Boneyard, in Tucson, Arizona. "According to the Los Angeles Times, the project cost $5 billion." Despite that program's failure, in 2015, USAF F-35 program chief Jeffrey Harrigian bragged that the F-35 fighter program might be equipped with laser weapons. However, according to Mardasov, "it's not clear how American specialists expect to overcome the laser's dependence on ideal weather conditions, or resolve the problem of a shortage of energy; if laser weapons were to be installed onboard the F-35, the size of their batteries would be comparable to its engine." In 1994, the journalist recalled, Nobel Prize-winning physicist Nikolai Basov, the head of the Soviet-era Terra-3 program, charged with developing a high-powered laser for missile defense, commented on the possibility for developing high-powered lasers as follows: "We have firmly established that no one will be able to bring down a ballistic rocket via a laser beam, and we for our part had advanced laser technology in a major way." Indeed, Mardasov suggested, Soviet scientists actively worked on the development of weaponized laser systems since the 1970s. Soviet scientists allegedly even created an open-type CO2-based laser, meant to paralyze missiles and aircraft, with its beam capable of striking targets the size of a coin. However, following the collapse of the USSR, all work on the creation of such weapons was halted. "But the know-how and technologies have not been lost," the journalist added. Recalling the best-known Soviet laser projects, the journalist recalled that they included a laser cannon mounted onboard the Dikson search and rescue vessel, the Terra-3 program, tested at the Sary-Shagan testing ground in the Kazakh SSR, the Skif spacecraft, capable of carrying a laser weapon, an air-based laser, mounted on board the Beriev A-60 airborne laser laboratory, and perhaps most famously, the 1K17 Szhatie mobile ground-based laser system (codenamed Stiletto by Western intelligence services). At the same time, Mardasov pointed out that both Western and post-Soviet Russian press has had a tendency to wildly exaggerate the power and effectiveness of laser weaponry, going so far as to speak of a mysterious 'laser-based carbine rifle', supposedly in stock with the Russian armed forces until 1995. The reality, the journalist noted, is that systems such as "the Soviet 1K17 mobile laser complex could at best blind enemy optics and their human operators, but not much more. Some experts have even argued that a weaponized laser is really a psychological weapon, given that it threatens the enemy with [literally] blinding scouting units, aircraft [operators], artillery gunners, snipers," and other personnel who use optical systems. "Today's laser systems have not advanced far beyond those of that period," Mardasov suggested. A series of problems remain unresolved. "Firstly, is the problem of excess heat. In the American Boeing-based 'flying laser' project, upwards of 80% of pulse energy was lost in the form of heat, and even in testing on the ground the aircraft's paint literally began to burn away from its intensity." "Secondly, the issue of the beam being scattered has not been resolved; dust, soot and smoke scatter the laser beam, weakening it. Thirdly, scientists are yet to create an optical lens capable of withstanding powerful laser beams; following one serious pulse, the melted lens needs to be replaced. According to some experts, this, along with the price, is one of the main obstacles to the use of laser-based weapons in space – one shot and the optical lens fails, and the system itself becomes much too hot." Therefore, Mardasov noted, "given that these problems are yet to be resolved, we can speak today only of very weak lasers capable of disabling small drones, suppressing optical-electronic systems and reconnaissance tools, and detecting reflections from optical sights, binoculars, etc." The KDHR-1N ranged chemical reconnaisance complex. 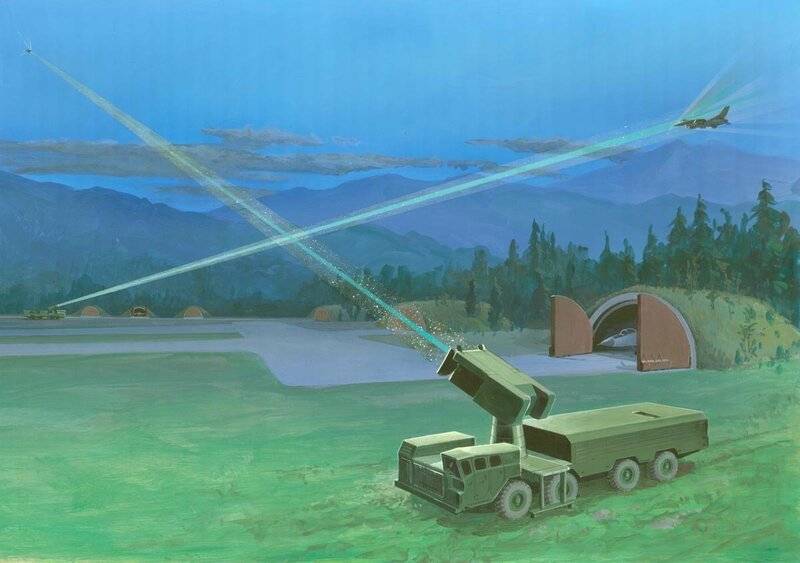 At the moment, the journalist suggested that probably the most effective real-world application of weaponized lasers in the Russian military is the KDHR-1H, a mobile reconnaissance unit using a laser locator to detect low-level atmospheric chemical contamination. Another system, the Potok, used by Russia's National Guard, consists of a non-lethal system meant to temporarily blind enemies. "In the Soviet period, mechanized infantry units were also equipped with the BMP-1C, a specialized modification of the BMP-1 infantry fighting vehicle equipped with the AV-1 laser, tasked with disabling enemy optical devices." Speaking to Svobodnaya Pressa, Viktor Murakhovsky, retired army colonel and member of the expert council of the Russian Military-Industrial Commission, recalled that many BMP-1Cs were initially deployed in the Far Eastern Military District. "After that, the military began being equipped with the 1K17 Szhatie, developed on the basis of Su-100P self-propelled anti-tank gun. Its purpose was to defeat the optoelectronic devices of enemy soldiers." Between two and 15 units were believed to have been produced. In 1990, a prototype 1K17 with an upgraded laser system featuring 12 optical channels was built; the system was recommended for adoption by the military in 1992, but in connection with the collapse of the USSR and the lack of funding it never entered into service. That system, Murakhovsky recalled, "was more powerful, and capable of operating at relatively long distances, against both land and air-based weapons systems." This kind of system, the analyst suggested, may very well be what Deputy Defense Minister Borisov had in mind when he referred to the commissioning of laser weapons systems for the military. "Because if we're talking about laser weapons capable of shooting down missiles, or something similar, this demands power capabilities which simply do not exist for mobile ground-based vehicles. This requires either a ship, or a permanent installation, and good weather conditions, since everything from humidity to fog, smoke, rain, and snow affect the laser's efficacy." Soviet Mobile Lasers Defending an Airfield. Visualization from a DoD report on the Soviet military's potential capabilities, 1980s. Moreover, Murakhovsky noted, "it's necessary to understand that defenses against laser weapons are provided by very primitive means." For example, a smokescreen created by a smoke grenade can effectively eliminate ground-based dangers caused by laser weapons. In other words, "it's not a miracle weapon – not a vundervaffe, but just one element of a weapon system which can be effective in certain circumstances, with significant limitations, similar to any other weapon." For his part, Andrei Frolov, editor-in-chief of Arms Exports magazine, suggested that it's possible that Borisov was referring to a tactical system, which can be mounted on armored vehicles. Finally, Denis Fedutinov, an expert in unmanned vehicles, suggested that while lasers are still in an experimental phase, work has advanced in recent years making them effective weapons. "If we are talking about the military tasks that can already be solved by these systems, these include air defense tasks, including against combat drones. In this area, the US has a strong position, developing systems such as the Avenger, HEL MD, and ADAM, with companies including Boeing, Northrop Grumman, Lockheed Martin and others involved in their creation." "Research in this area is also being conducted in Europe," Fedutinov added. "For example, back in 2011, the German company Rheinmetall tested a high-energy laser weapon mounted on the C-RAM rotating defense turret, in the course of which it was able to successfully defeat a UAV. China too is involved in the work on laser weapons. In 2014, it was reported that an experiment by the Chinese Academy of Engineering Physics resulted in the downing of a small drone hit from a distance of two kilometers." Effectively, Russia, having accrued tremendous experience in the creation of laser weapons systems in the Soviet period, is effectively simply returning to the field. But rather than science fiction-like ideas, it's likely that what engineers are working on are tried and tested systems for real world military applications. Who is the Target for the US Navy’s Newly Developed Railguns and Lasers?